Leaks of substances into the sea, damage to underwater structures, machine rooms flooded… these were real challenges that emergency services working at the Fukushima Daiichi nuclear power station had to face. euRathlon is an outdoor robotics competition funded by the European Union with a focus on realistic cooperative search and rescue response scenarios for land, sea and air robots. Inspired by the 2011 Fukushima accident, the competition is in its second year, after a successful euRathlon 2013 land robotics competition in Germany. This year the competition aims to advance the state-of-the-art in autonomous underwater/surface vehicles by challenging multi-disciplinary teams of students and engineers with autonomous missions in the marine environment. Six teams have qualified for euRathlon 2014. We will be providing coverage of the competition, which will take place at the Centre for Maritime Research and Experimentation (CMRE), La Spezia, Italy, from September 29-October 3, 2014. The competition scenarios for euRathlon 2014 focus on those aspects of the Fukushima-like accident that will characterize the euRathlon 2015 Grand Challenge. This means that teams can use the 2014 sea competition as an opportunity to design and test marine robots ready to take part in the 2015 cooperative land-sea-air robotics challenge. Descriptions of the five scenarios were published early in 2014 to allow teams to comment on them and to prepare their vehicles. A draft of the scoring table was also published in advance for teams to discuss on the website-based euRathlon forum. Detailed descriptions of the scenarios were not given to the teams so as to keep an element of uncertainty, as it would be in the real world. Successfully tackling the competition scenarios is not an easy task. Teams were required to undertake a qualifying process to prove that their vehicle(s) would be able to cope with the scenarios. The teams were asked to write a Scenario Application Paper (SAP) for each of the scenarios they were planning to enter. In the SAPs they describe their robot(s) and explain how they plan to address the technical challenges for each specific scenario. A technical advisory board reviewed the SAPs to check that each team’s proposed solutions are realistic. Feedback from this process was given to the teams to help them prepare for the competition. 1. AVALON — The team from DFKI GmbH and the University of Bremen will participate in all five scenarios with their robots: “Avalon”, “Dagon” and “ASV”. 2. CISSAU – CISSAU is one of the two teams from the Institute of ENSTA Bretagne, France, that are going to be present in euRathlon sea competition. Their robot “Vici” will participate in all five scenarios. 3. ROBDOS – Robdos is formed by a group of students from the University Polytechnic of Madrid (UPM) and the Spanish-based company Robdos. They will participate with one of the SPARUS II that euRathlon has loaned to them, in long range autonomous navigation, environmental survey and leak localisation scenarios. 4. SHARK – SHARK is the team of researchers from the TeCIP Institute and the Scuola Superiore Sant’Anna, Pisa, Italy. They will participate with “SHARK”, another SPARUS II loaned by euRathlon, in the long range autonomous navigation and the environmental survey scenarios. 5. SAUC’ISSE – The second team from the Institute of ENSTA Bretagne, France. They will participate with their robot “SAUC’ISSE” in the long range autonomous navigation, the environmental survey, leak localisation and structure inspection, and the combined scenario. 6. 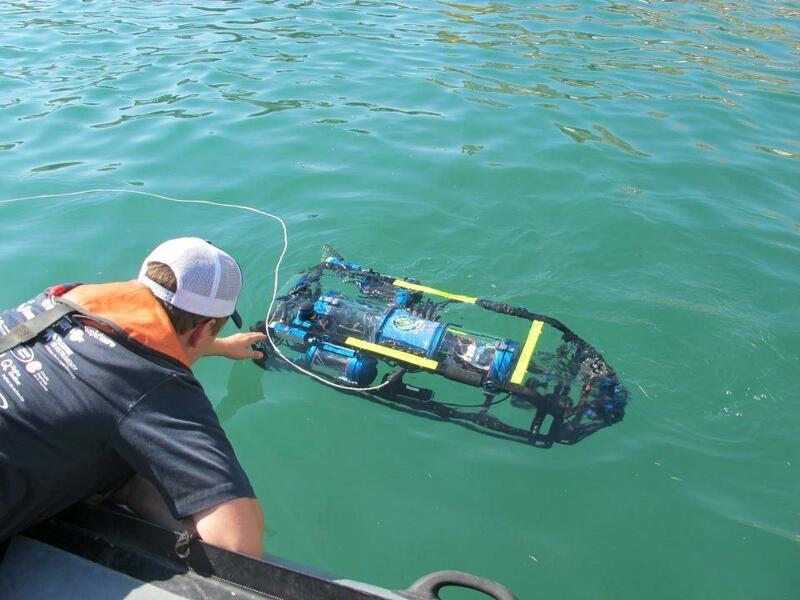 UNIVERSITY OF GIRONA – The team from the University of Girona is formed by students and researchers of the Underwater Vision & Robotics Research Centre (CIRS). The team develops and operates the robot vehicle “SPARUS II” that will participate in long range autonomous navigation, environmental survey, and leak localisation scenarios.